Here's a shout out to all you change makers! 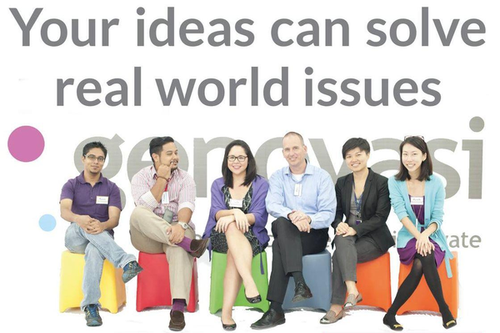 Genovasi in collaboration with The Zhariff Initiative is organising Genovasi Reimagination, a nation building challenge and Design Thinking workshop dedicated to helping you re-imagine your nation. You will be using Design Thinking, a human-centred approach to innovation and a prototype driven methodology that focuses on user experience, brainstorming, rapid prototyping, and testing. It is a methodology that has been used by organisations worldwide in solving a wide range of challenges. You will have the opportunity to address challenges from a topic of your choice: Environment, Safety, Accountability, Urban Poor, Learning Experience, and Malaysian Experience. You can register as an individual or as a group, so please feel free to share this poster! To register, email press.play@genovasi.my that you're interested and we'll send you an Excel registration form to fill up and send back.